Saturn’s Moon Titan is a remarkable place; it’s the only place aside for the Earth which has liquids on its surface – albeit, the liquid isn’t water, but rather hydrocarbons: methane and ethane. Titan is too cold to have liquid water on its surface, but that doesn’t make it any less spectacular. NASA’s Cassini spacecraft captured some amazing pictures of the sunlight bouncing off of them, as you can see below. “In the past, Cassini had captured, separately, views of the polar seas and the sun glinting off them, but this is the first time both have been seen together in the same view”, NASA said on their website. Indeed, the achievements of the Cassini probe are fantastic. From Saturn’s orbit, it took pictures of Venus, the Earth, and of course, Saturn and Titan. It even managed to capture some hydrocarbon rivers flowing on the satellite’s surface. These images were taken in infrared, to allow researchers to better see the surface through the hydrocarbon haze which perpetually shrouds the moon. The atmosphere of Titan is known as the only fully developed atmosphere that exists on a natural satellite in the Solar System. Ever since the early 20th century it was believed that Titan has not only an atmosphere, but also liquids on its surfaces. 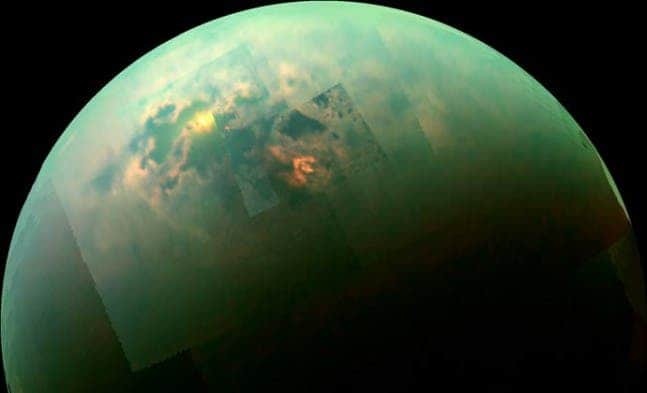 Observations from the Voyager space probes have shown that the Titanean atmosphere is denser than Earth’s, hazing the satellite, and the Cassini probe showed that Titan has a complex weather system, with hydrocarbon rains, rivers and oceans. 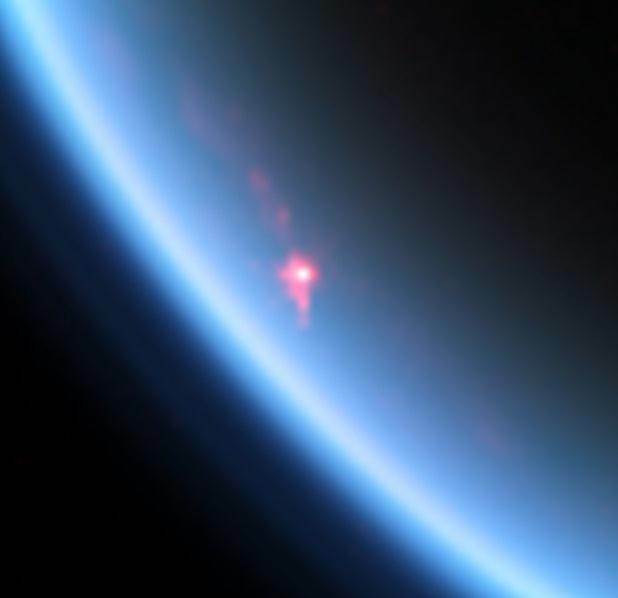 As you can see, an arrow-shaped complex of bright methane clouds hovers near Titan’s north pole. These clouds are causing almost continuous rainfall, constantly refilling the lakes. However, evaporation is the dominant phenomenon at this time. You can observe a “bathtub ring,” or bright margin, around Kraken Mare (the sea containing the reflected sunglint). This means that it was bigger at some point, but through evaporation, it has lost some of its liquids. This bears a striking similarity to Earth’s own hydrological system, where some seas become smaller while others grow. Along the years, Cassini has often time showed photos which supported this similarity, most notably rivers flowing into lakes and oceans. However, there are also many huge differences. Titan is much colder than the coldest places on our planet, hence we have liquid methane instead of water. Also, there appear to be no currents in the water bodies, only shallow waves; for the most part, they seem to be almost perfectly flat. It’s still not clear if Titan hosts any type of life forms. In June 2010, scientists analysing data from the Cassini–Huygens mission reported anomalies in the atmosphere near the surface which could be consistent with the presence of methane-producing organisms, but may alternatively be due to non-living chemical or meteorological processes. The fact that it doesn’t have any liquid water on the surface indicates that we shouldn’t expect to find water-based life forms, but there have been consistent indications of liquid water under the layer of ice. 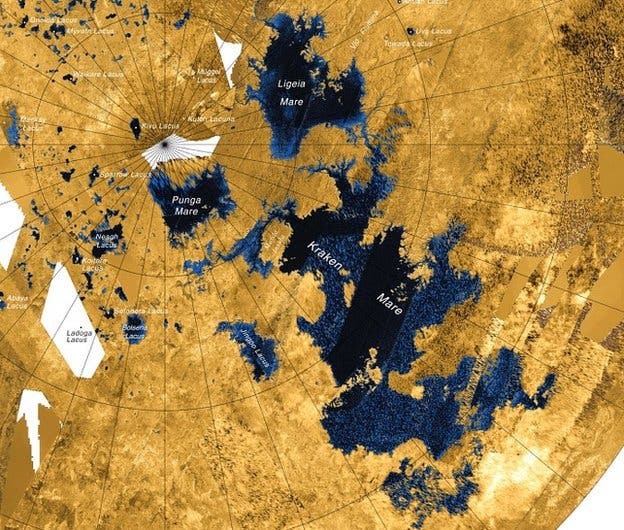 The proposed Titan Mare Explorer mission, a low-cost lander which would splash down in a lake, “would have the possibility of detecting life”, according to cosmologist Chris Impey of the University of Arizona. The proposed start date for that mission is 2016.